RAPAPORT... The Israeli government has pledged $284 million (NIS 1 billion) to guarantee bank loans to diamond companies in an effort to ease the trade’s severe credit difficulties. The team — led by Naama Kaufman-Pass, deputy director-general of the nation’s Ministry of Economy and Industry — released its findings earlier this month, highlighting several ways in which the industry had hit a crisis. Banks’ perception of the diamond sector as high-risk has led to a decline in total lending to the Israeli trade from $2.5 billion in 2008 to about $1 billion last year, the committee said in its report. Financial institutions are also refusing to accept dealers’ inventory as collateral, while competition from India and Belgium has added further damage to Israel’s market position. To this end, the government fund will back companies’ borrowing, meaning that if they fail to repay a loan to a bank, the state will pay. While the committee submitted the policy to Eli Cohen, minister of industry and economy, as a recommendation, the lawmaker said the government was set to go ahead with the program. 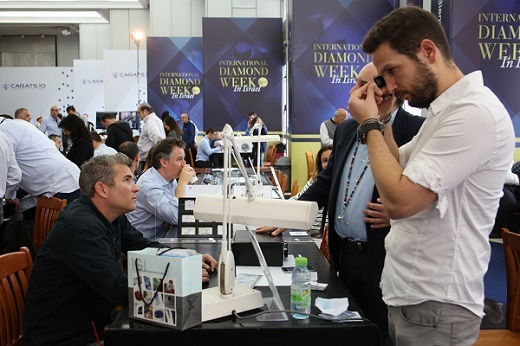 The diamond trade is an important segment of the Israeli economy, representing about 13% of total exports, and employing about 9,500 people, according to the report. However, the 2008 global financial crash led to a 27% slump in Israel’s polished-diamond exports between that year and 2016, with the Chinese market slump in 2015 also denting demand. Shay Rinsky, director-general of the Ministry of Economy and Industry, set up the committee in September to delve into issues of credit and growth in the diamond trade and examine how to bring the industry forward.